the hat have the adjustable band inside that you can draw up and tie to make it fit better for a smaller head. New with tags. Brand: Lawliet -Sizes: one size (approx. 57-58 cm) the hat have the adjustable band inside that you can draw up and tie to make it fit better for a smaller head. 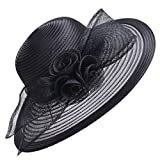 -Material: satin/sinamay/Crin -Brim: approx. 11 cm -Height of crown: approx. 10 cm -Quantity: 1 pcs Many Colors to choose Wash care information: Don’t wash,just clean it with wet cloth which was been wrung out.